Coleman equipment is your best source for genuine OEM Kubota M Series Tractor parts online or in our stores. We have more than 60,000 Kubota part numbers in our inventory ready to ship directly to your door, or for fast pickup in one of our Kansas City area stores. We have common service parts listed, and online parts catalogs for Kubota M series tractors. Browse through the lists below, or call one of our certified parts specialists today. We can find you the Kubota M series tractor parts you need to keep you in the field and handling any project. The hood of your tractor has a decal with your model number, such as “M9000”. However, the true Kubota model number contains more identifiers at the end that are not always included in the decal, or on the serial number plate. 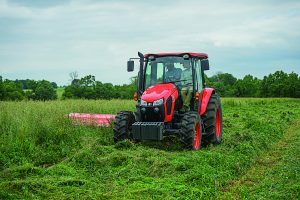 Below is a common list of the model suffixes for Kubota M and MX tractors. Hopefully this helps guide you to the correct parts diagram to locate your Kubota parts. Once you have the correct model please select the link from the lists below.